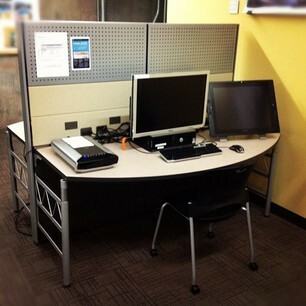 The UO Portland library provides academic workstations with large monitors; two iMacs and four Windows PCs. These workstations are restricted to UO users with Duck IDs. These workstations are loaded with a wide range of applications including standard productivity, design, and mapping software. In addition to the suite of software found here, the academic workstations in Portland also include AutoCAD, AutoDesk Revit, and Rhino. Connected equipment includes a Wacom pen tablet, Nikon slide scanner, Epson large format flatbed scanner, and several Epson desktop scanners. There are also two Internet workstations allowing network access without UO log-in. The UO Library catalog and databases, as well as the Internet generally, are available from these workstations. Limit non-research activities to 30 minutes. Faculty, staff and students affiliated with Oregon State University, Portland State University, and eduroam partner institutions can use their login credentials from their home institution to login to the UO network. Information Services offers guest wireless self-service accounts for UO visitors to provide access to the Internet with the visitor's laptop. This feature allows UO visitors to register themselves for UO Guest wireless access for 7 days at a time. There is no limit to the number of times a guest may self-register. Guest wireless accounts do not give guests access to licensed library resources or provide a login for academic workstations. The UO Libraries provide access to ArcMap/ArcGIS and a variety of datasets, available for download. ArcMap/ArcGIS is installed on the library's academic workstations and is available for download on student Windows computers. For further information, see the page on GIS services, or contact UO Libraries' Map and Aerial Photography Library.